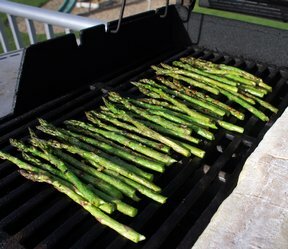 Grilled asparagus complements any meat. Be careful not to lose any spears between the grill grates. You can cook them over a sheet of tin foil to avoid the possibility. Seasoned perfectly. Rinse asparagus. Take one asparagus and bend it until it snaps, usually about 2 inches from the bottom end. Line the single asparagus with the rest of the package and cut the rest of asparagus even with the snapped portion of the asparagus. Brush olive oil over all the asparagus. 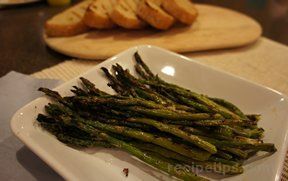 Sprinkle the garlic over the asparagus and season with salt and pepper. Set on hot grill and grill until done. 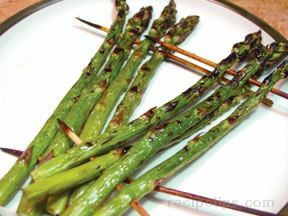 The asparagus will turn to a bright green and will be slightly more tender. Do not over cook or it will get get mushy. "I grilled these on a piece of foil so I wouldn't lose any in the cracks. I finished it off with a little Parmesan cheese when it was done. Perfect beside our steaks!"